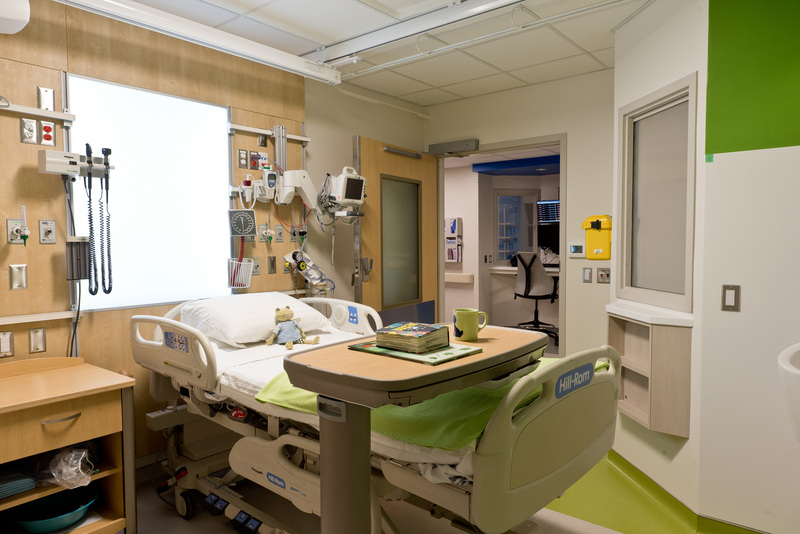 Over the years, we’ve enjoyed working with The Hospital for Sick Children (SickKids) on hundreds of projects, including the redesign of Intermediate Care for Ward 7C, completed in November 2017. 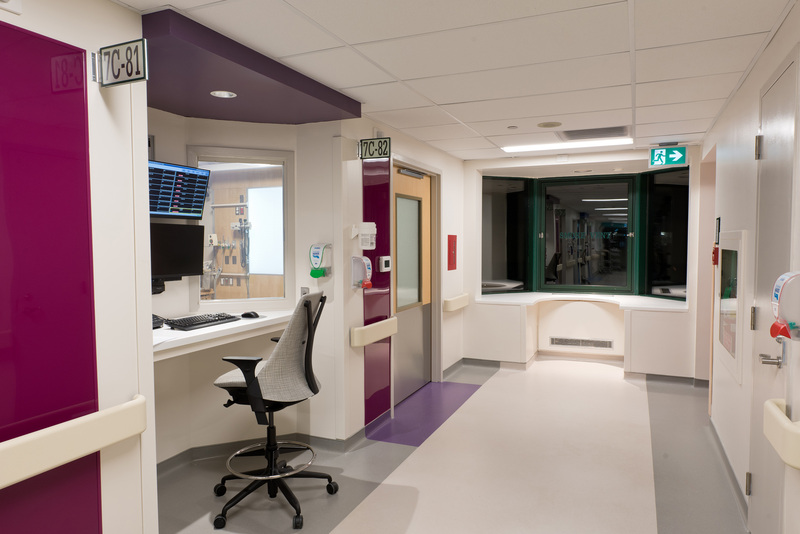 SickKids required a redesign that would allow for greater ability to nurse intermediate level patients on the Paediatric and Respiratory Medicine inpatient unit (7C). 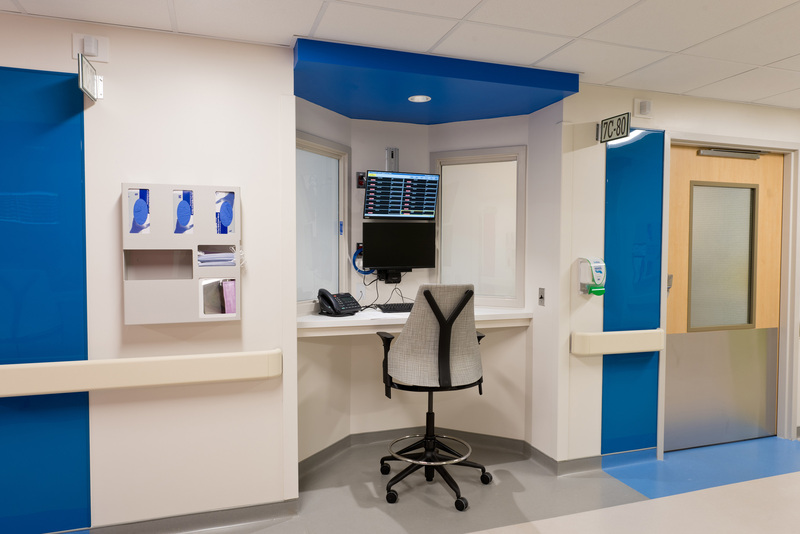 The new physical layout optimizes nursing resources with the addition of observation nooks in the corridors to allow for 1:2 intermediate care nursing and the redesign of the patient rooms. Studies show specific patient-to-nurse ratios can improve clinical outcomes, including improved patient satisfaction, and reduced length of stay and readmission rates. 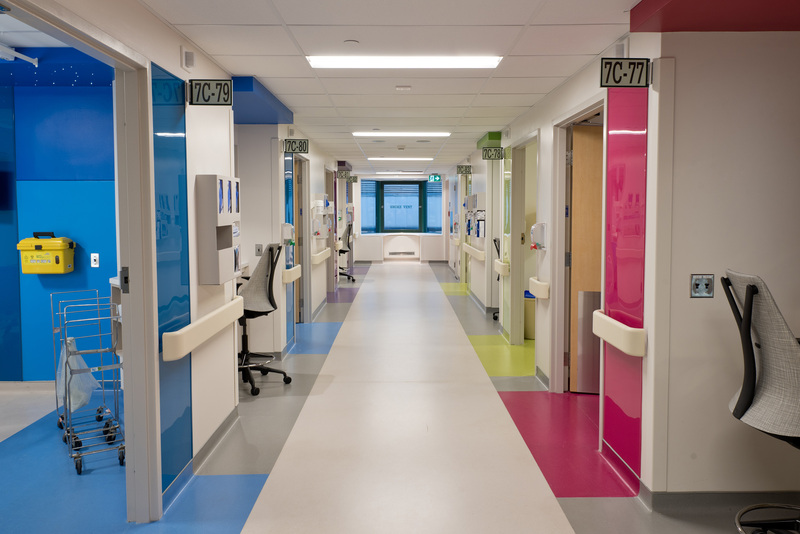 The corridors, observation nooks and patient rooms were painted in one of four uplifting, vibrant, and fun accent colours suitable for ages 0-18. Blue, purple, green and pink were chosen for their ability to promote calm and lower stress. The ward’s four observation alcoves each look into two patient rooms. Windows are equipped with electrified switchable glass which can be darkened to provide patients privacy, when their care teams aren’t observing. Since care professionals may be standing at the alcove for extended periods of time, we installed rubber sheet flooring to ease the strain on the lower body and joints. Bulkheads over the alcoves are each painted in one of the bright, accent colours. The colour corresponds to the two rooms on either side. (For example, a blue alcove is situated between to blue rooms.) This colour highlights the entrances to patient rooms in the form of a cleanable, high gloss panel beside the door, and patterned flooring below. Coloured flooring continues into the room to indicate an area that is to remain free from carts or equipment. We used various shades of the room’s accent colour on the footwall and bulkhead, including fibre optic twinkle lights, creating a positive distraction for the patients and their families. 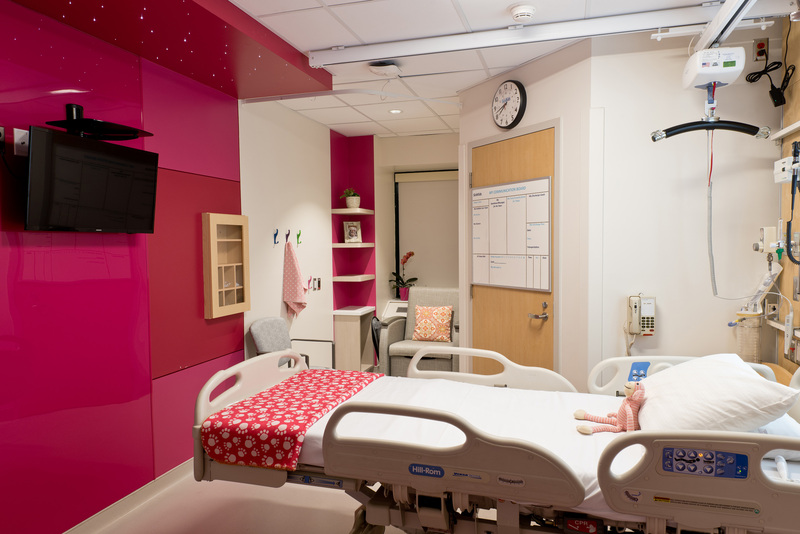 The footwall serves as the mount for the room’s TV and, since patients spend most of their time in bed facing this wall, we wanted it to be visually appealing and dynamic. The bed’s headwall includes a backlit graphic panel functioning as a nightlight for young children, seen above. In the washrooms, a highly cleanable and seamless wall paneling system was painted with the room’s accent colour to make the space more kid-friendly, and feel less institutional. To accommodate family members and visitors, we created a family-friendly zone nearest the window with built-in cubbies and floating shelves for personal belongings (seen in the middle two images above). “We are extremely happy with the outcome of the project. We appreciated your team’s diligence and creativity in designing this space to move our vision to reality. Your respectful cooperation in navigating the challenges of conducting this work in a busy inpatient area has been invaluable throughout the renovation process. We are also very pleased with the quality of the work and attention to detail.” Since its opening, “the new space has been universally admired by staff across the hospital and most importantly by patients and families. Thank you for working with us to create a better, safer experience for the children and families in our care.” Kate Langrish, RN, BNSc, MN, Clinical Director, Paediatric Medicine, Complex Care, Patient Access and Transitional Care, The Hospital for Sick Children.